I Want A Cheap Beach Wagon That Doesn't Mind Getting Salty! What Car Should I Buy? Mike is totally over this whole winter thing. 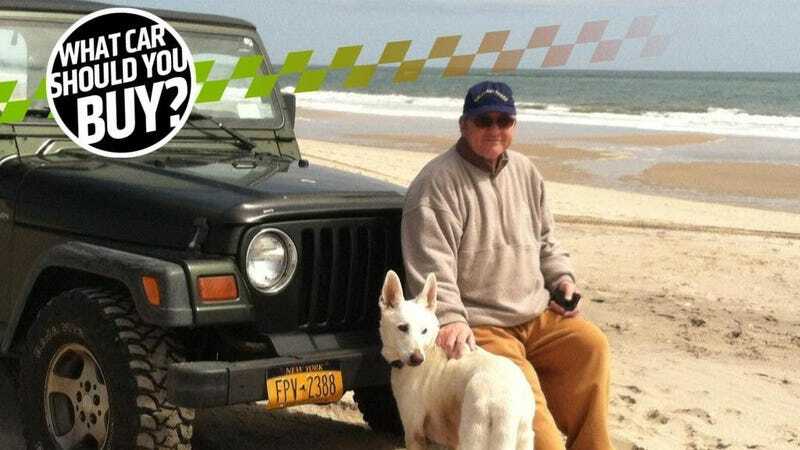 He loves the beach and chases storms, so what he’s looking for a cheap 4x4 just in time for summer. It just needs to take him and his gear through the sand. What car should he buy? I’m looking for a 4WD beach wagon, (it doesn’t actually have to be a wagon. SUV, truck, or whatever) for under $3500 so I don’t need collision insurance and I can get back on the beach. Summer’s coming! Mike, I was so excited to take this case because like you, I’m a beach bum. When I was in high school, I would obsess over incoming storms and what the waves would be like on a given day. I also used the word “gnarly.” Excessively. I wanted so badly to recommend a Jeep Grand Wagoneer because I saw one as a kid in an awesome teal blue with a matching surfboard and I thought that was the coolest surfer car ever. Unfortunately, unless you are David Tracy and luck out with some cheap Wagoner that needs a lot of work, the good ones are mad expensive. You’ll have to settle for the next best thing: the tried and true XJ Cherokee. They are cheap, durable, have a legit four-wheel drive system and, as David can testify, a little rust here and there just gives them some extra character. Here is a two-door not far from you that looks clean... enough. Honestly, it’s hard to find any faults in Tom’s argument. Even I admit that if you’re looking for something like a Jeep...just buy a Jeep. But! The car world is full of interesting cars, cars that should not be ignored. Also there are Baja Bugs, but you want to be driving a car, not spending all weekend trying to figure out how you’re going to change your wheel bearings in a parking lot. It is with this in mind that I will recommend the wonderful Dodge Raider, a car that everyone forgets existed. Back in the day Chrysler brought over re-badged Mitsubishis to America as captive imports. We usually think of how the Mitsubishi 3000GT became the Dodge Stealth or how the Mitsubishi Eclipse became the Eagle Talon, but it’s easy to gloss over the Mitsubishi Montero/Pajero that became the Dodge Raider. Thankfully, so does the used car market, and a decent condition old-school truck like this one for $2200 is still well within your budget. When you say you need a cheap, reliable four- or all-wheel drive car for whatever reason, my mind always goes to older Subarus. They’re cheap, reliable (for the most part, but not like Honda-level invincible) and tough as nails. I nearly suggested an Outback or a Forester for this task. Those are plentiful on Craigslist and generally cheap. But! It was suggested to me that maybe another Subaru is better at hauling your beach crap, and more interesting: the Baja trucklet of the 2000s. Wouldn’t that be fun and different? These things are pretty hardy, plus they combine all the good stuff about Subarus with all the utility of a small truck. Hell, they should bring them back. The Baja would probably sell well in the current market. Here’s a 2003 non-turbo model for sale in New Hampshire for just $3,200. Nice price. Unfortunately, my editors have banned me from recommending Jeeps in What Car Should You Buy articles. That’s a damn shame, because there are few vehicles on this earth as beach-worthy as a Willys Station Wagon. But no matter, because in a stroke of utter genius, I’ve found a workaround to this totally unfair rule: the Ford Rural. Oh yes, it’s totally a Ford (and not a Jeep). Offered in Brazil in the late ’60s until the late ’70s, the Ford (and not a Jeep) Rural was based on the Willys Wagon platform, with the Blue Oval having purchased the Toledo-based company’s Brazil plant in 1967 (despite those bones, that tailgate, as shown above, says Ford, making this very much not a Jeep). The Rural is pretty much everything you need, Mike. It’s got tons of room, it’s four-wheel drive, and parts are easy to find since they’re basically Jeep (but also, very much not Jeep) parts. Can you find one for under $3,500? Probably not. I Want The Newest But Cheapest Car Possible! What Car Should I Buy? I&apos;m Looking For The Ultimate Camping Excursion Vehicle! What Car Should I Buy? I&apos;m Looking For Something Comfortable And Quirky But Not Too Flashy! What Car Should I Buy?